In 2013, Augusta State University and Georgia Health Sciences University merged into the University of Georgia system, ultimately becoming Augusta University (AU) in 2015. The university system predicted years of enrollment decline following the merger, but AU wanted to take steps to beat that forecast and produce enrollment growth. The challenge was daunting as the two universities could not have been more different. One was a highly selective university and the other operated on an open-access model. The end result was that AU became the fourth research institution in the University of Georgia System, a major culture change especially from the open-access side. 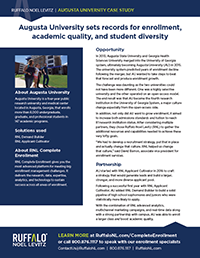 In addition, not only did AU want to grow enrollment, it aimed to increase both admissions standards and tuition to reach R1 research institution status. After considering multiple partners, they chose Ruffalo Noel Levitz (RNL) to gather the additional resources and capabilities needed to achieve these very lofty goals. “We had to develop a recruitment strategy, put that in place and actually change that culture. 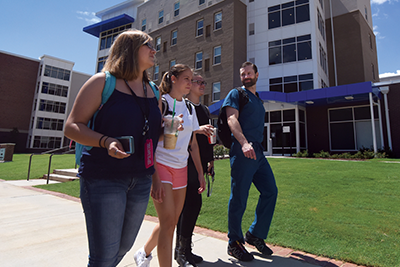 RNL helped us change that culture,” said David Barron, associate vice president for enrollment services. AU started with RNL Applicant Cultivator in 2016 to craft a strategy that would generate leads and build a larger, stronger, and more diverse applicant pool. Following a successful first year with RNL Applicant Cultivator, AU added RNL Demand Builder to build a solid pipeline of high school sophomores and juniors who were statistically more likely to apply. With the combination of RNL advanced analytics, multichannel marketing campaigns, and real-time data along with a strong partnership with campus, AU was able to enroll a larger class and boost academic quality. As enrollment continued to grow, so did the need for additional classes and campus infrastructure to support the increase in students. AU built a new residence hall for freshmen in 2016, and as growth has continued to trend upward, the campus is now looking at additional campus improvements to capitalize on this growth, make the institution more competitive for students, and provide additional resources to support student success. A 23 percent increase in applications. A 21 percent increase in acceptances. A 16 percent increase in freshman enrollment and the largest first-time, full-time freshmen cohort in institutional history (since 1828). The most diverse and academically prepared freshman class in institutional history, with more than 50 percent students of color and a record-breaking freshman index (GPA and SAT/ACT). The changes in enrollment, academic quality, and diversity have given Barron a great deal of satisfaction as he and the rest of the AU staff are not only meeting their goals, but fulfilling a higher mission for the students they enroll.